Heyo, I'm mikurubeam297 and welcome to Draconianism's petpage! This page is dedicated on guiding interested fashion freaks on becoming modelers for finding new images for official sites of DTI, Jellyneo's Wardrobe, and Sunnyneo for all of us to create new customizations to plan, share, and to treasure. Each official website navigation tab shows the steps of how to model on that specific site and the projects tab are the current modeling needs that I have chosen to focus upon to complete. We might not get very exclusive items to be modeled, but we'll try to do what is reasonably possible. All and all, go out there and model, and stay fashionable! Current Project: Recent NP wearables and Color Restricted Wearables at Model Mayhem! 1. Wear the wanted wearable on the desired species in your species' Customize page and remember to hit "Save Changes!". 2. Head over to DTI and there you will find two ways of how to model there. 3.a In the mid-right lower part of your screen, there's a textbox marks as "Modeling Hub" where you enter your species' name in there to model. Hit "submit" and that pet will be displayed on the front page for the meanwhile with a banner thanking you for showing them your pet. 3.b In the "Enter your pet's name" textbox, you can just input your species' name with the desired modeling item there. Hit "Plan my outfit!" and you'll be transported to another page to the customization page of the pet. 4. You might notice your points bar on top increased if you're logged in to your DTI account and possibly see your DTI username on the front page that you modeled said item. Also you see the item appear in its own item page with the species now being able to wear said item with your DTI username below the page thanking you. This shows you've modeled! X. Another way how to model aside from the front page is by the Modeling Hub's main page. 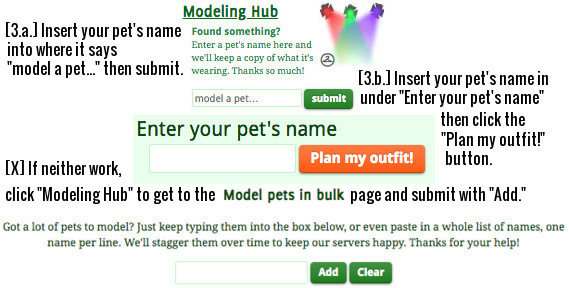 It is the same instructions as up to Step 2, but in this page you can multiple pets (or the same species, but not having the pet refresh each submission) to model! You will have to input your desired pet's name into the "Model pets in bulk" text box and hit "Add" to submit. 2. Head over to Jellyneo's Customization Wardrobe which can be located starting at the front page to the more sections dropdown in the top right corner under "Customization Wardrobe". There in another page, you head over to "Model for us!" link on the right side to where you can model. 3. There you'll find Jellyneo's instructions on how to model on there. I could write about it, but I could also do that later. Basically species name with desired item into the textbox in the bottom right corner. 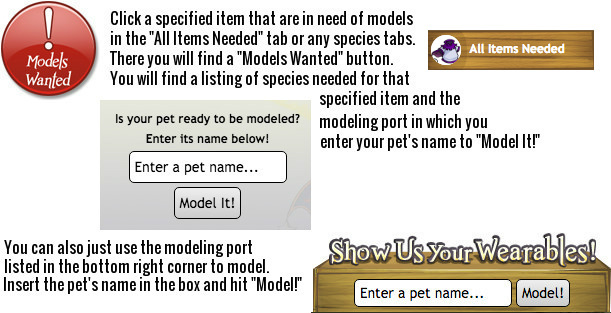 On an item page where it says "Models Wanted" in the top right corner, click that and there's a textbox where you submit the desired pet to model. 2. Head over to Sunnyneo's modeling page which is located right below the customization listing on the left side of the home page. There you can find the listings of what needs to be modeled there and the link of where you can model them. 3. Go to the "Model them" link where you will be sent to another page. There you will find a textbox where you input the name of the species with the desired clothing to model. 4.Hit "Go!" and see if you have added the Flash Url. That's a model right there! If it's a PNG model, that's the first model without any other clothing aside from the desired wearable. You don't need to take off all the other clothing for a Flash Url model and that's pretty much it! Note: Due to the lack of communication and transgressions done about re/modeling wearables, I will no longer be supporting SunnyNeo. The SunnyNeo modeling instructions and list will remain available on my petpages, but I will no longer be updating those sections anymore until further notice. In the lists below, we're currently seeking anyone that can model the bolded wearables below. Everything listed can be worn by said normal colored species. If you are an owner of a species for a item and happen to also own the item, it would be really cool if you can model them in the sites down below. The NP items, you can ask mikurubeam297 for a possible lend. Also please check out Model Mayhem for the Restricted Color Models Needs! Just let us know if you know or own one of these coloured species to model with. The name of the specified coloured species are the only requirement needed! Do I have to take off my other clothing to model a wearable? No, you do not! Sunnyneo might need the wearable modeled by itself for introductory purposes, but those are usually done by the first model, so its not necessary afterwards. If you're doing colors on DTI, it would be preferred if you did it bare or with their all their painted clothes alone (that's why sometimes you see new colored pets previewed with clothing with DTI). Oh good, I like having my clothes on. Do I have to make an account to model on those sites? No, but if you'd like to record your contributions and such, you're free to do so! DTI and JN provides some wonderful applications like wishlists to share with others. Hey, I didn't get points for modeling on DTI/JN? The model was possibly already discovered or you weren't logged in to said official site. Although I did have reports of points not being rewarded over colors and emotions and the mechanics behind that are beyond my understanding. I'm trying to model a missing emotion, but it seems to not model? They could be already modeled and need to be updated or in some cases they have an 'Emotion Error.' Various colored species have might be missing a certain feature, share features with the other gender, or something else that's just not right. This is common to worry much and if you notice that any of these errors have been fixed then please remodel! Today doesn't seem to be a very good day. On DTI, why are there multiple Emotions and/or Unlabeled appearances? * Newer colored species (initially 2016) stopped updating because the function that was used to auto-label emotions came to a halt with site updates. I'm uncertain if this will be fixed, but maybe we will see them in the near future. * Some colored species have dithering appearances in which they would often have multiple sets of emotion models. For example, a Male Elderly Tuskaninny can have normal Tuskaninny facials but will occasionally switch between a model with Elderly features. This cannot be controlled whatsoever and changes sporadically. * Castle Nox's Corridor of Chance is to blame for the weird Body Effect and broken models. From this NC game, you have the chance of receiving a Bonus Effect upon playing. This effect behaves as a new model and will stay on your pet for five days. Ideally I would refrain from purposely modeling these effects and I'm not sure if these models will be removed. Why is the DTI static (Image) preview different that the static image on the site? DTI takes and uploads the initial image of the model like if it was the first draft of an essay. The static preview on the site is like the edited and finalized version of the essay. Why can't Vandagyres wear any clothing compared the other species? Vandagyres were released on November 15, 2014 and every wearable applied to it's body before that date cannot be put on it unfortunately. This applies to newer Baby, Maraquan, and Mutant (except Maraquan Mynci). Wait why is Maraquan Mynci excluded or able to wear non-special clothing? THIS IS OUTRAGEOUS! Only thing outrageous here is that one Grarrl set, but Maraquan Mynci share the same body shape as any other Mynci. The same bit goes to some Invisible Species which you can find over at uncertainty. Oh, I party on Tuesdays. My pet #------- can't be modeled on DTI, is there something wrong with it? Pets that start with numbers (1, 2, 3, etc.) cannot be shown with DTI's modeling and planning showcase unfortunately due to its programming language built on, but surely there's more of that colored species alike out there. Can I make a request to get a certain clothing modeled or color? Absolutely! Although, I won't put up species day wearables for how quickly those get modeled and extremely rare wearables like Fancy Theatrical Cape for example of how non-existent they are. Only 9 of me were ever released muahahaha! So hey, can the credits page be like if I helped out modeling something, my name will be there? As of now, I'm going to say no, because you can already get commemorated over there, but I'm still contemplating on it. I will on the other hand will absolutely link your pet directories and alike if wanted! I don't have the item to model, but I have the pet that's needed, can I still model? Sure, usually for NP wearables on special colors (Baby, Maraquan, Mutant, etc), I seek them out for any lenders or try to restock myself to lend out around to get them model. NC items can be very difficult to get around to lend and I feel risky, since it's dealing with NC in general (might have to research more on lending with both NP & NC). Although, that doesn't stop us from getting the word out that there is pet that needs to be modeled! Are you even allowed to talk about modeling items? Yes, that's fine. :) Anything that shares the latter half of the URL, such as *.jellyneo.net or *.sunnyneo.com is an approved link, so it can be posted and discussed. Hello! Previously, links to Dress to Impress were not allowed. Buuuuut, *drum roll* Dress to Impress has been made a Recommended Fan Site! So no more grey areas - users are now free to discuss and link away :) Enjoy! Even if I don't have anything to model with, is there anything I can do to help? Spread the word! Maybe you have a neofriend that has something that you can introduce them to the works. Any other questions or comments feel free to neomail me at mikurubeam297!